Rhonda Porter lives in West Seattle with her husband, their cat Rocko and puppy (flat coated retriever) Hitch. 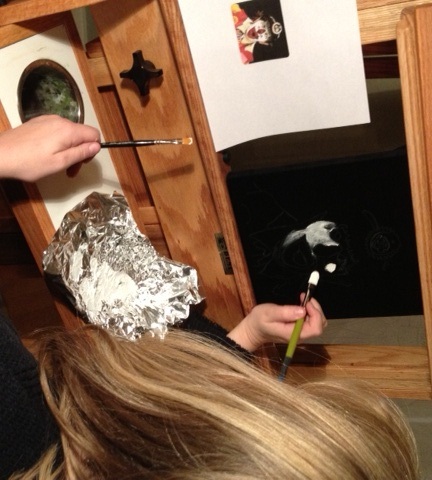 One day her husband started musing over the old black velvet paintings his older brothers used to have and how great they would look in his potential “man room” (now the the kids are gone)… that’s when she decided to start painting again and to try out painting on velvet. If you’re interested in purchasing Rhonda’s artwork, please click here. During the day, Rhonda is a Licensed Mortgage Originator (MLO 121324) for homes located anywhere in Washington. Check out her nationally recognized mortgage blog The Mortgage Porter. If you’re looking for Rhonda Porter, the mortgage originator and not the painter – you’ve found the right Rhonda… just not the right blog. Visit http://www.mortgageporter.com if that’s what you’re interested in. In addition to her family, pets, painting and helping people with their mortgage needs, Rhonda also enjoys cooking. You can check out her cooking blog at www.sipnsimmer.com.